This Shimmering Special Premium Arrangement of Sunlit Blossoms is a perfect souvenir for esteeming the home-return of a successful mountaineer and conveying to the person your heart-felt wishes for his/her triumph. 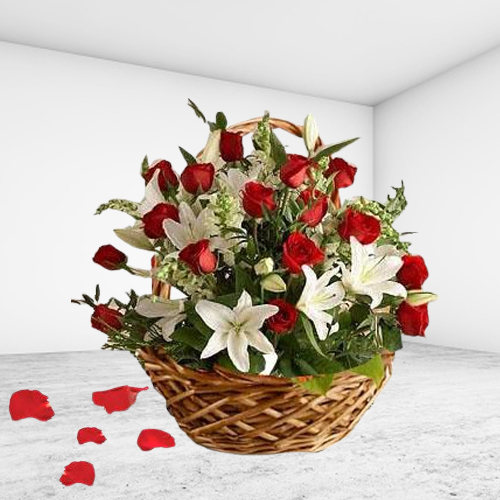 This Special Premium Arrangement exhibits sublime Blossoms such as 3 White Lilies and 10 Red Roses. Note: Wooden Basket may vary. Flowers Delivery Nadiad, Send sweets Hyderabad, Wedding Cake Jammu, Diwali Mithai Tirunelveli, Send Flowers and Gifts to Solan, Online Shop Marmagao, Flower to Salem, New Year Flowers Meerut , Fresh Fruits Bhilwara, Send Gift Hosiarpur, Dry Fruits to Rishikesh, Birthday Delivery Ahmedabad, Sending to Haridwar, Flower shop Kapurthala, Mhow Online Cake Delivery.